Category: Film Reviews - Hey, Kenna Rae! Duck and Cover, Here Comes Tremors 5! Writers: M.A. Deuce, C.J. Strebor, William Truesmith and John Whelpley. Cast: Michael Gross, Jamie Kennedy. More than ten years after the last Tremors film, Tremors 4: The Legend Begins,(which is actually a prequel) the flesh-hungry graboids are back for more blood! Too bad nobody cares. This fifth film in the series is a sequel to Tremors 3: Back to Perfection. Even with the return of franchise star Michael Gross (Family Ties) as Burt Gummer, and the addition of another horror franchise star, Jamie Kennedy, (Scream series) almost nothing is salvageable from the wreckage of this unnecessary fifth installment. Admittedly, this viewer has not seen any of the Tremors sequels, but thoroughly enjoyed the 1990 original, so was hoping for at least some cheesy B-Movie-type entertainment. Unfortunately, entertainment was not high on the agenda of these filmmakers. This film takes us from the Nevada desert to South Africa, more specifically, to the World Heritage Site of the Cradle of Humankind. *full disclosure: a DVD screener of this film was provided by Midnight Releasing. Cast: Milo Cawthorne, Olivia Tennet and Ari Boyland. From the makers of various popular children's television shows, including Power Rangers R.P.M. 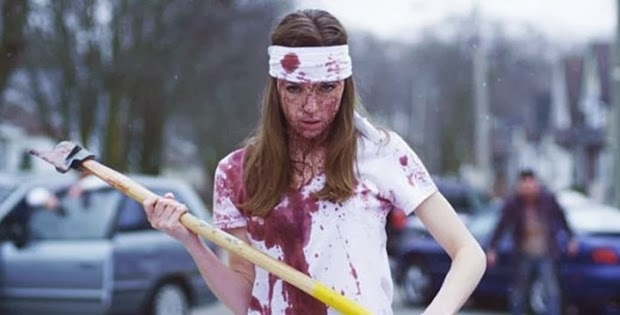 comes the smart, kickass horror comedy, Blood Punch! Though seemingly unlikely to venture into the horror genre, writer Eddie Guzelian and director Madellaine Paxon come across as seasoned veterans. This high energy, action-packed, hysterical splatter fest with have you wondering why the two weren't making horror films all along. Blood Punch is a clever concoction of comedy, gore and a fantastic original story with stellar performances. Containing all the elements of a cult classic, this film is sure to spark the interest of Evil Dead heads and genre die-hards alike. If you're looking for something fun, smart and original, then put this on your must see list. The film begins with a bang—Milton wakes up to find a video of himself that he doesn't remember making. In this video, he ends up cutting off two of his fingers. Written and directed by: Francois Simard, Anouk Whissell and Yoann-Karl Whissell. Cast: Munro Chambers, Laurence Leboeuf, Aaron Jeffrey and Michael Ironside. Turbo Kid is an action-packed gory retro-future adventure from Canada-New Zealand directing team RKSS (Francois Simard, Anouk Whissell and Yoann-Karl Whissell). Don't let the lively description fool you, though; this film tries to do way too much and, in doing so, accomplishes very little. Set in the year 1997, the film claims that “this is the future.” While the opening sequence includes high energy '80s music, throwing back to 1986's bicycle-motocross movie, Rad, and fun video game-inspired credits, once the story lifts off, the entertainment value comes crashing down. As a tribute to past '80s flicks, Turbo Kid does too much looking back when the story needed to be pushed forward. Aside from the campy gore, nifty backdrop and a couple strong supporting actors, the film had this viewer wanting to blast off in another direction. The Kid (Munro Chambers) is a comic book loving teenage boy trying to survive in a '90s post-apocalyptic wasteland. This scavenger collects relics from the past, particularly '80s toys, pink flamingo lawn ornaments and comic books featuring his beloved superhero, Turbo Rider. Who's Afraid of the Big Bad Wolf-Woman? Writers: Rasmus Birch, Christoffer Boe, Jonas Alexander Arnby. Cast: Sonia Suhl, Lars Mikkelsen, Sonya Richter. When Animals Dream is the first feature-length film from Danish director, Jonas Alexander Arnby. This artsy body horror/drama premiered at the Cannes Film Festival in 2014, receiving well-deserved critical acclaim. In the film, sixteen-year-old Marie struggles to form an identity in a small coastal town. To make matters worse, she discovers that she's not like other females, or other humans. Although female coming of age stories are fairly common in horror movies (2000's Ginger Snaps being one of the better ones), there is something unique about this picture. Something subtle. Without copious amounts of violence and gore, this picture slowly tightens its grip, pulling the viewer in. This is not a start to finish action-packed edge of your seat film, but the setting and characters help create a cinematic experience that will prove rewarding if you persevere through the slow burn of the first half. *full disclosure: a DVD screener of this film was provided by Vertical Entertainment. Writers: Jack Reher and Guy Moshe. Cast: James Marsden, Thomas Jane, Piper Perabo, Scott Glenn and Billy Bob Thornton. David Hackl (Saw V) and his all-star cast take you deep into Alaska's picturesque woods in search of a killer bear in Into The Grizzly Maze. The film, which was actually shot in Vancouver, is an intense thriller with a clear moral agenda—to raise awareness about our destructive role in environmental degradation. While the film's message is strong, it's not too heavy-handed in its delivery, still allowing for an action-packed “natural horror”adventure. Though unnecessary, the celebrity cast makes for a more enjoyable watch; it's fun to see big name actors like Billy Bob Thornton (Monster's Ball) venture into the woods, looking to take on a blood-thirsty beast. Albeit not as gripping as one might hope, the story serves a purpose, and the stunning scenery as well as Bart the Bear (Into the Wild) are sure to please. Despite a couple of dull stereotypical characters and tropes, and the needless use of CGI in a few scenes, getting lost inside the Grizzly Maze isn't all that bad. Writers: Cody Calahan, Chad Archibald, Jeff Maher. Cast: Michelle Mylett, Josette Halpert, Stephen Bogaert. Cody Calahan and Chad Archibald of Black Fawn Films reunite in the sequel to 2013's Antisocial. This viewer is not a fan of the first film, so we already got off on the wrong foot but, having enjoyed Black Fawn's recent release, Bite, there was still hope for redemption. Unfortunately, even with some great atmospheric shots and some decent gore, Antisocial 2, much like the first, is simply uninteresting. While the message that social media turns people into zombies has potential, the concept is overthought and under-executed thus rendering it powerless. The plot in the second film is driven by an update being installed on the social media site, The Social Redroom. The update will supposedly force everyone to become users—to connect. Suffice it to say, watching the film is about as exciting as waiting for an update to complete. The characters are flat, the acting is uninspired, the script is riddled with exposition, and the story is dull enough to make you want to check your Facebook feed. So much for establishing a connection. *full disclosure: a DVD screener of this film was provided by Artsploitation Films. Writers: J Blakeson (The Disappearance of Alice Creed) and Frank Ketelaar. Cast: Sarah Chronis, Tygo Gernandt, Marwan Kenzari. Dutch director Joram Lursen (primarily known for romantic comedies and Dutch television shows) enters into thriller territory with Reckless(Bloedlink), his version of 2009's The Disappearance of Alice Creed. While this viewer has not seen the original, there's a general consensus that this remake does not stray far from the first and, according to some critics, even surpasses it. In Lursen's film, Laura Temming, the daughter of a wealthy real estate mogul, is kidnapped by two masked men and held for ransom. Over a period of roughly two days, we observe the three characters in close quarters and discover that there's much more going on than anticipated. Reckless not only delivers an intriguing plot with phenomenal acting, but also surprises with an intimacy that creates a heightened sense of tension and anxiety, providing an interesting glimpse into the three characters and their motivations. Laura Temming is kidnapped in broad daylight by two masked assailants, then taken to a soundproof apartment where she is stripped naked and tied to a bed. *full disclosure: an online screener of this film was provided by Black Fawn Films. Writers: Jayme Laforest, Chad Archibald. Cast: Elma Begovic, Annette Wozniak, Jordan Gray, Denise Yuen. Director Chad Archibald (The Drownsman) is guaranteed to make your skin crawl in his icky entertaining horror film, Bite! What begins as a seemingly banal scenario with stereotypical females on a bachelorette party vacation, turns out to be a gripping grim tale of transformation, betrayal and revenge. Archibald is clever in setting his audience up with a potential snore fest, then creeping in to deliver a strong story with good characters and a healthy dose of gooey gore. Somewhat reminiscent of Cronenberg's The Fly(1986), though revolving around infection not experiment, this film belongs inside the category of “body horror.” That said, it nearly crosses over into a creature-feature, and dips its feet into the realm of horror comedy. Whatever you want to call it, Bite serves up an incredibly enjoyable horrifying experience that is sure to infest your mind for quite some time. Writers: Tom Green and Jay Basu. Cast: Johnny Harris, Sam Keeley, Joe Dempsie, Parker Sawyers. Monsters: Dark Continent is the sequel to Gareth Edwards' 2010 film, Monsters. The sequel takes place ten years after the first, when the threat has reached a global scale. The only thing the two films share is the fact that the monsters themselves play a minor role, and that they lack entertainment value. Other than that, the two films are essentially unrelated. In Dark Continent, writer/director Tom Green (not of "The Tom Green Show") revolves his story around a group of infantile roughneck soldiers from the ruins of Detroit who have been recruited to head to the Middle East for a special mission. Unfortunately, Green's own mission is not clear—is this a sci-fi action flick, a creature-feature, or a war film? Whatever the case, neither was executed well. Furthermore, the film's message is a bit foggy; it's hard to decide whether this is a pro or anti-America film, and also who Green's audience is—sci-fi nerds, war movie enthusiasts, or a pack of dim-witted bros. The latter being the more educated guess.